"Blood money" - by Lewis Peake. 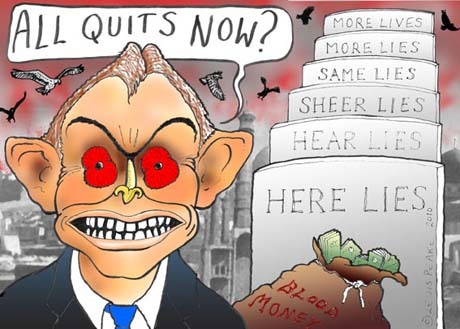 A political cartoon inspired by reports that former British Prime Minister Tony Blair has promised to donate the multi-million-pound proceeds of his autobiography to the Royal British Legion, a charity for injured troops. We chose to keep this one up because Tony Blair is now making the rounds in the U.S. promoting his book.